On the left we have your router sharing connectivity to the internet between one or more computers and an access point. On the left, we have another access point configured to act as a bridge, into which you've plugged your PC using an ethernet or wired connection. I'm assuming that the access point on the right is configured to act as a bridge. This is an important point. An access point and a bridge are not the same thing. An access point is, as its name implies, a point from which other devices can access the wireless network. The access point acting as a bridge on the right, in this scenario, is one of those "other devices" - it connects to the "real" wireless access point on the left. 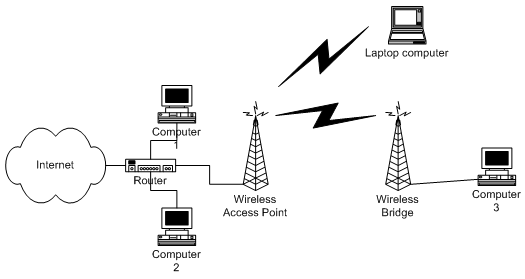 The way the bridge is used in the scenario you outline, it's very much like a wireless network adapter, allowing your single PC on the right to connect to the wireless network. As we'll see in a moment, it can actually do a little more than that. "An access point and a bridge are not the same thing." I also want to point out that there are wireless devices that simple are bridges. Rather than configuring an access point to "act like" a bridge, a dedicated bridge is typically much simpler to set up for its purpose. In this case the laptop simply connected to the existing wireless network via the access point on the left. No tricks or games, no additional hardware, it's just the normal way to connect a laptop to an existing network. Here you can see we've placed a hub between the bridge and the wired computer on the right, and connected the laptop to that hub. In fact, you could add several additional computers to that hub, and they'd all be able to share the wireless connection that the bridge provides. This is a common way to extend a network when physical wiring isn't an option. The creates a second wireless network which is connected to the first. It's one approach to extending a wireless network beyond its initial range. This technique creates what's called a "repeater" - a bridge connected to an access point. And, just like the bridges themselves, there are dedicated wireless devices which are repeaters. Caveat as you can see this scenario is not necessarily simple, and it's not a scenario I've actually implemented. In theory it should work. Naturally it relies on being able to run physical wiring to the location of each access point. When that's not possible, the bridged approach above is a reasonable compromise. I tend to favor the wired approach, however, as being less error prone and easier to maintain. If there's a way I can run wire and use only simple access points, that's typically the direction I'll design things myself. And finally, I do want to point out that these are only examples. Depending on your own needs, your configuration will probably be different. Switches can be used instead of hubs, you might have the ability to wire more computers, or place wireless access points and/or bridges in ways that would be different than the diagrams I've outlined above. But hopefully I've provided some ideas and a starting point. Can I use a second wireless access point to extend my wireless network? Depending on what you're planning, you can use a second wireless point to extend your wireless network. I presently have a Belkin setup utilizing a Wireless Router that has 3 "wireless" Access points conected to it.. I still had a range problem, so I connected another router in a Bridge configuration, wirelessly to the original router..
On the Second Router I hung 3 additional wireless access points.. Hence: Two Routers connected in a bridge configuration and 6 access points all extending the range of the Routers.. Only 1 cable from the PC to the Initial Router..
Works flawlessly and serves many boxes ..
You can also use a Linksys WRE54G Range extender (repeater) out at the edge of the first access points signal and it will simply boost and repeat everything both ways wirelessly. I have a dlink dsl524t router+modem that is connceted thru cat6 cable to dlink3200 access point at the first floor.i have another two access points for 2nd and 3rd floors.i need 2nd and 3rd floor internet via wirelssly connection i don't want to run cat6 cable.i tried in wireless repetor mode (wds MODE)i put the mac address of all dlink aps and i put the same ssid same chanels but at 2nd and 3rd floor internet is not coming only iam getting at 1st floor. please help me sir. I had gone thru the posted article and its really informative. Now I got an issue. I got an internet connection to my house thru an eternet (RJ45) cable. The provider had issued a static IP address and my pc is configured to use internet. Is it possible to share this conection to another PC? What device will be better for this purpose. A router or an access point or...? Please propose me a better solution. I have a wireless router (linksys WRT54G) connected to a modem at the third floor. The range only extend up to the 2nd floor. At the 2nd floor, I have a wireless access point (linksys WAP54G). How do I configure the router and the access point so that i can extend the wireless range to the first floor? HOw do I create the Wireless Bridge?? i want to connect my computer to the internet how but i dont how to go about it.i want you to hlep me pls,give me the step. Also for the more "technically adventurous" you can build a WiFi Cantenna, which has high gain, but is highly directional. Fortunately, I can connect my new wireless access point at one of my house to an existing wireless router at the opposite end of the house via wire. My goal is to wander throughout my house with an iPhone that doesn't know or care which of the two devices it is talking to. Both radios are using the same band and channel, and naturally the remaining wireless settings, e.g. SSID and security protocols are the same. Some people suggest the devices should use different radio channels to avoid overlap but then that's precisely what I'm trying to achieve, isn't it? I don't know about other smart phones but the two iPhones my wife and I use seem very fussy when it comes to switching among WiFi nets and/or a cellular network. Thanks in advance for any thoughts or referrals. I want to setup like Option #2. I currently have a wireless network but need to add a wired network area where I can not run a cable to connect 2 devices. You mentioned the problems of adding wireless to a Home network. Here is how I did it. Some of your readers might want to add a wireless "router" but not use it as a router, but to expand their network to include a wireless "router." This uses the wireless capablities as a "switch" allowing wireless connections to the network. (In my case I ame using a used Netgear Cable TV modem that my son-in-law replaced for a newer one -- I don't mind saving a few bucks by using some one elses junk--and also save our world from the accumulation of junk -- works for me). Now you can access the wireless router by a notebook computer using the wireless connection. The two special settings are both under "LAN settings" on the router. 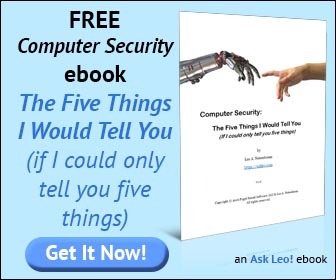 you'll have to manually give the computer an IP address on the appropriate network. it into other LAN ports seemed to work fine. @Donald. Or you could just turn off DHCP and enable WAN to LAN bridging most router have that feature somewhere hidden or it can be used after you upgrade the firmware with custom firmware on your router. see DDWRT, OPENWRT or TOMATO for details.